When selecting your hardwood floors, it’s important to choose an option that fits the design aesthetic of your home. But it’s also important to understand the types of lumber that you’ll choose from. Lumber is usually cut in one of the following three ways—plain sawn, quarter sawn, or rift sawn. The names denote the way the lumber was oriented and cut at its respective sawmill. The type of cut also indicates growth ring orientation on the board’s end grain as well as the mechanical properties and the figure that’s used to describe it. Some of these terms (i.e. growth rings) might sound foreign but fear not. 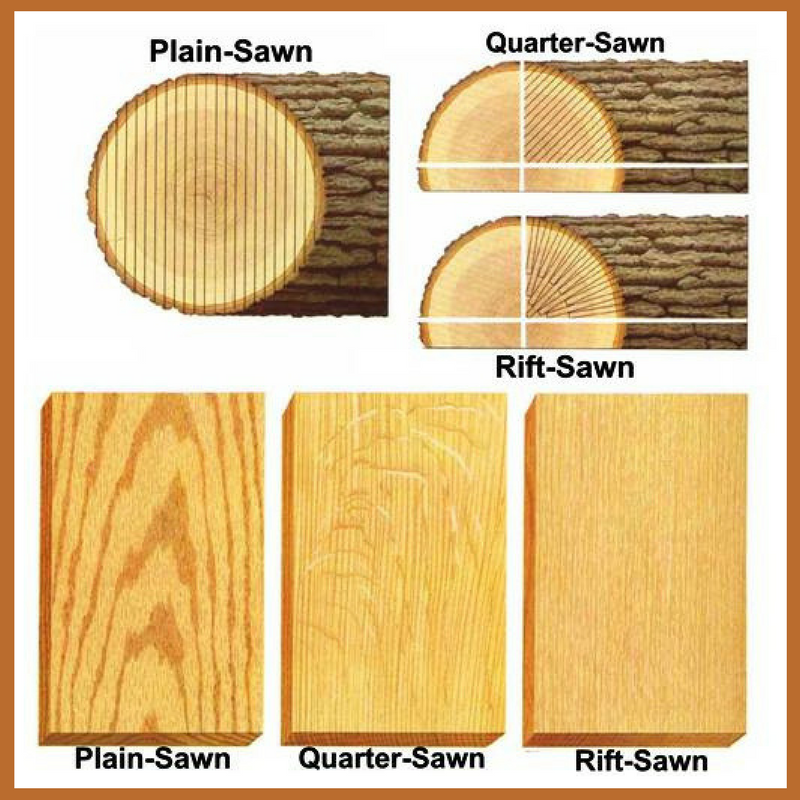 There are some easy ways to tell the different cuts of lumber apart. Plain sawn lumber, also known as flat sawn lumber, is the most affordable lumber, and thus, it’s the most common. The annular rings, which are the growth rings you’ll find when viewing the cross-section of a tree trunk, intersect the board’s face at 30 degrees. In manufacturing, this is called a tangential grain. In layman’s terms, this type of lumber usually has a cathedral-type pattern on its face. Quarter sawn lumber is your mid-grade board. It’s still relatively common but comes at a slightly higher price than its plain sawn counterpart. With quarter sawn lumber, the annular rings intersect the board’s face at angles of 60-90 degrees. Sawmills cut this lumber into four quarters at a radial angle. The resulting boards easily lend themselves to striking design choices and, in white and red oak, you’ll even notice dramatic flecking. By far, rift sawn lumber is both the most expensive and least common option on the market. Here, the annular rings look best at 45 degrees but can fall anywhere between 30-60 degrees. Rift sawn boards are either cut as complements to previously cut quarter sawn boards or purposely sawn using the rift method. During the manufacturing process, the lumber is sawn at an angle perpendicular to its annular rings. This results in a linear grain pattern that has no flecking. Though rift sawn lumber has the most unique look and is the most stable, this manufacturing method produces the most waste. Hence, it’s the most expensive of the three types covered on this list. As the consumer, you’re most concerned with the look and aesthetic appeal of your new hardwood floors. But cost and quality should also be of utmost concern. So, minor technical details about whether your lumber was plain, quarter, or rift sawn come into play. Choose the option that best suits your budget, design preferences, and structural needs.